This was the last untamed room. 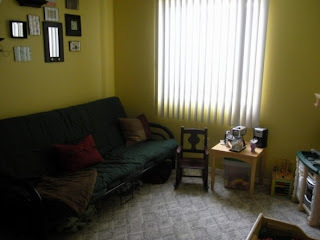 This "room" has been represented in every home we've moved into. The place where all 1/2 and 1/4-full boxes of all kinds of random stuff go that we didn't immediately need or have a place for when we unpacked the house. I know. It's bad. We never showed it to anyone, I promise. The first thing I did was remove everything from the room and begin the sort: keep in storage, keep and put it away in it's spot in the house, give, sell at my garage sale, and toss. The neighborhood garage sale, by the way, was my main motivator (aside from the fact that I've wanted to do this since we moved in) for finishing this last week. Free advertising? I'm there. Oh, and we live on the corner, so traffic to my garage should be high. Come on over Saturday morning. I'll sell you my junk. Here's the results after day one. 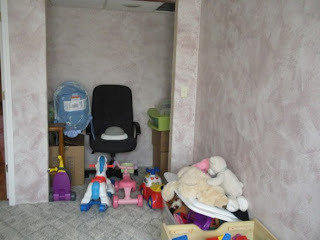 The room was cleared out to only what would stay, which was little, then I moved all the toys from the family room into the new play room. The closet is full of the stuff you can buy on Saturday. The next step was painting these.... Yeah, I know. I think so too. This entire project was an exercise in using what I have. 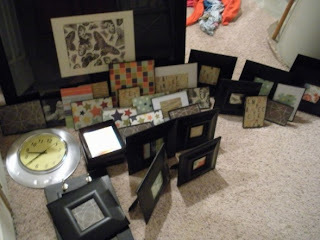 There were over 50 unused black frames in those leftover boxes. 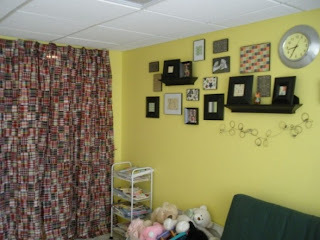 I took the girls to Hobby Lobby (since this is their room and all) and picked out several sheets of scrapbook paper to put in the frames. Have I mentioned how much I love framing paper?? Oh, I have? Well, it's worth repeating. Then, I assembled the room. 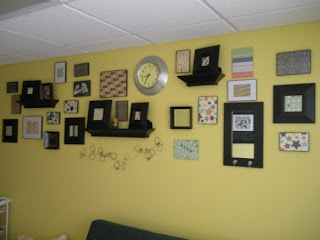 I already had everything- the frames, shelves, etc. All I added was paper. 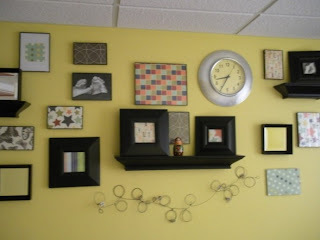 The thing with the circles has clips, so we hang their artwork from it. I made it a really, really long time ago. 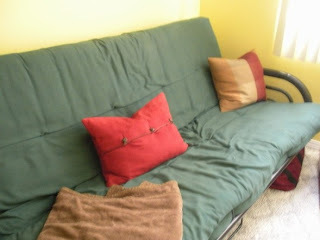 This is the futon, the one Jim had throughout college, and even served as our first sofa. Sweet memories. It's been disassembled for several years, and now it's back and comfortable, and wonderful for curling up with books at story time. I even found a color scheme that made the green work. The pillows and blankets were a box-discovery too. I also had this frame. The girls immediately wanted this paper, and I wouldn't have normally picked it out for this, but, I think it looks really great here. 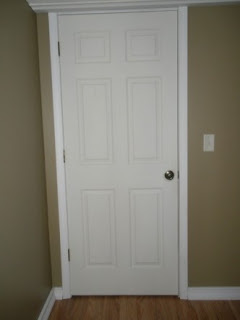 Here's the new closet, painted the lovely Oyster Bay. 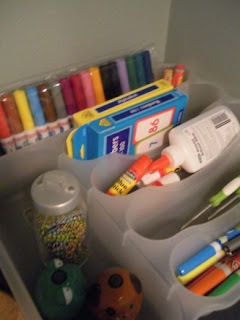 The closet holds all our home school stuff, and my craft stuff. That mirror was in another box too. 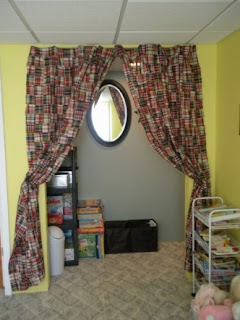 I got the fabric for the curtains at Hobby Lobby and I absolutely love madras, so this was great. 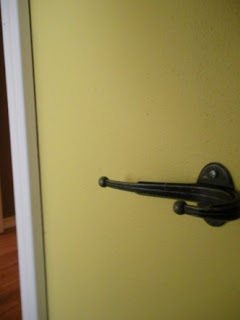 I hung it with upholstery tacks. At first I hemmed the edges with my trusty glue gun, and then took it apart. For now, I think I like the uneven edge. 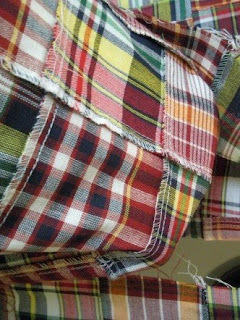 If I ever don't, I'll just take the 10 minutes and hem it up. 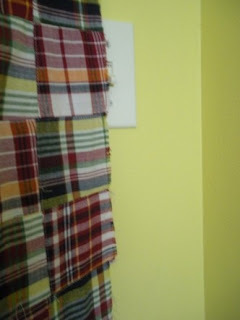 Here's one of the four purchases I made, fourth to the paper, curtain fabric and paint- a cheap and useful shelf. The very first paper towel holder we ever had is now a ribbon organizer. An old silverware tray serves as an organizer for supplies. Oh, and there's me. Ah, the beauty of using stuff you had stuffed in a box. 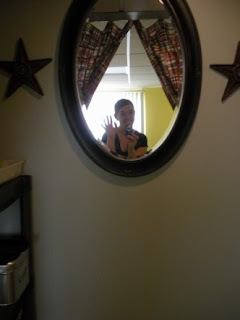 I love the stars, but there wasn't a place in the house they would work- but they're fun here. 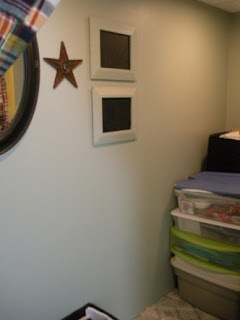 And those are two chalk boards, painted Oyster Bay as well. There's my craft totes. I'll organize them better...someday. 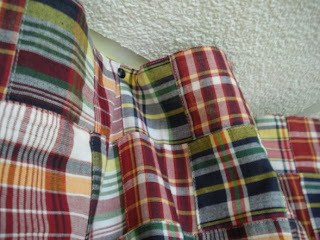 I really do love this fabric. It's lots of individual squares sewn together. 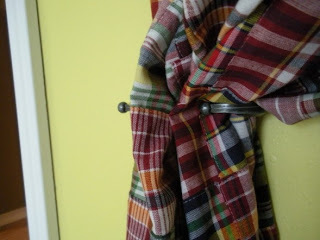 Some extra hooks from IKEA now make excellent curtain hold-backs. But most of the time, all those supplies are out of sight, out of mind for the kids. See that bench under the table? I've had it since I was little. I had thought I would need to get some extra seating for this table (our first table in our first apartment, a hand me down, so sentimental. All my first terrible meals were eaten here by two in-love and clueless kids.) Anyway, the bench used to hold some of our games for the kids, but now those are all in the closet and I filled it with our puzzles. It fits perfectly under the table. And, I think it's cute. 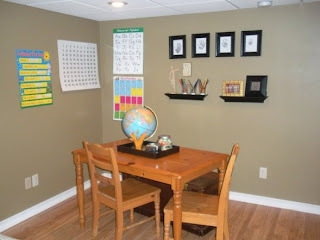 I wanted a globe for our school room for a while- I loved the globe when I was a kid. Still do. I got this one for $3 at a g sale. 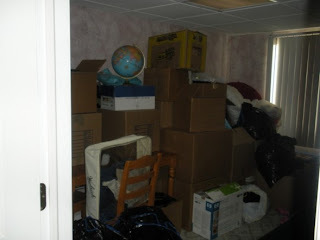 Again, everything in this room was already here, in a box tucked away. The only thing I bought for the school spot was those clear plastic cups for our colored pencils. 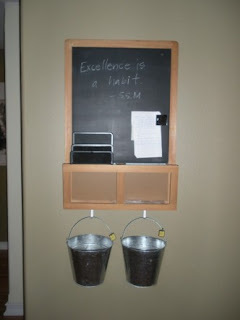 I found a home for this chalk board, and these buckets, which were free at a garage sale. 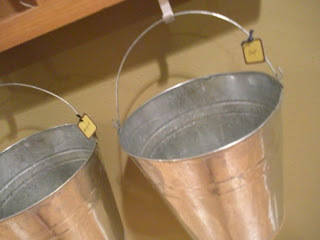 Now the buckets are our "out" box and our recycling bin. By the way, I promise that this will be the last House Beautiful post for a while. Wait, can I promise that??? Well, there will be fewer, that's for sure. To everything there is a season, and for these last weeks, this season of taming has consumed me. Posts of a completely different nature are right around the corner, I'm sure. But, I do love it when you show me your houses, so, maybe you don't mind. Megan, Megan, Megan I'll say it again....where were you last year (and all the years) when I was still teaching??? I've told you how I wish I'd had you to talk to the teens in my "On your own" classes about money managemnet....or even to my adults in the college child dev. classes I teach about family finances .... but.... where I really needed you was in my interior design classes. 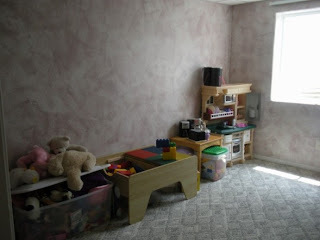 I had one assignment called "Budget Beautiful" where the kids were suppose to redo a room using things they already had or could get for free or by spending $25 or less. Where were you??? I could have taken this whole post and had them read it. I'm sure showing them how clever and creative you are would have given them ideas and inspiration. You are amazing. The room looks beautiful, versatile and useful. I know that your family will really enjoy using it.Great job!!! I give you an "A+"
p.s. 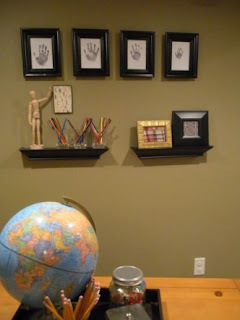 I forgot to tell you how much I love the framed hand prints. 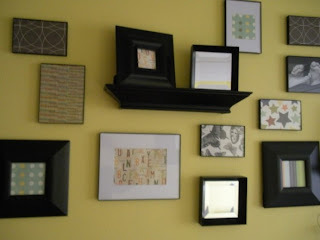 Framing paper is a great idea too. I wish that I'd thought of that when I was teaching. I told my students to look in magazines to find prints they could frame but I never thought of using scapebook paper..... and I have tons of it we could have used....urgg... again I say I wish I had known you back then. i love everything. 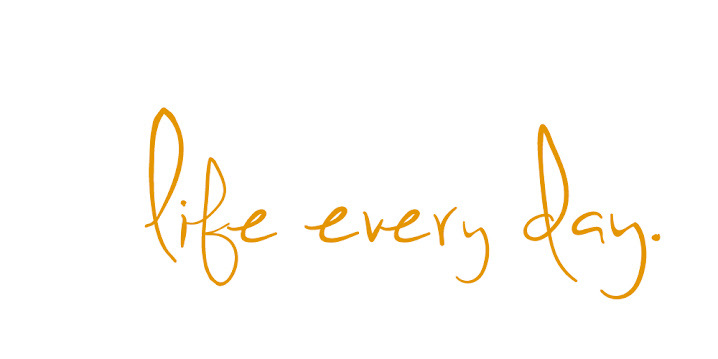 every single thing. and please don't be alarmed when you check your traffic later and i have visited this post like 50 times! there is sooo much to take in, i just want to look over and over again!! Everything looks great! I have a house that needs help ,if you get bored and need to do something! I mean, that you do all that on your own is amazing enough, but that you did it WITH four kids and with stuff you already had? Unbelievable!!! It looks really, really great! 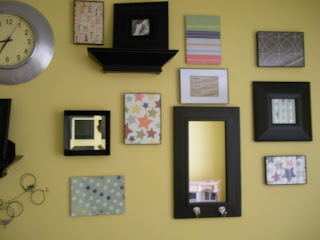 Someday when I have my own house that I can paint whatever fantastic color I want, I will call you. And you can come over and we can have a decorating party, because I am like a little boat lost at sea when it comes to decorating. You are like a cruise ship. I bet it feels great to have a house that is put together and didn't break the bank. Oh, I think I hear your husband now, sitting at the gate of the city calling you BLESSED! 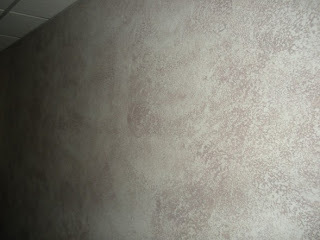 I'm so dumb because I painted and re-did a whole room in the house and I never took a before picture. So dumb! 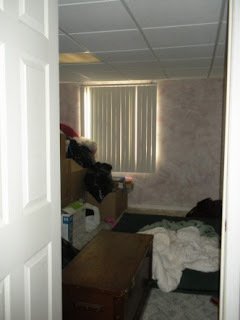 Maybe I can find part of the room in an old pic. ps- did you come peek in my windows for the pencil in the cups idea? j/k but I love that look. So cute. WOW Megan! I can't even begin to tell you how impressive that was. The before and then the after. Again, I think all I am left with is WOW! I like Amanda will be back again to soak it all in. It IS THAT GOOD!! I can't believe you are done decorating your house already (okay, I know decorating is a fluid thing that is never really finished). Remember when we were both house-hunting on the same weekend? Months later you have already done all this work and I have yet to close on a house. It looks great! I am so inspired to get my house and start changing it. I knew when I first came to this blog that I liked you. As I read some of your past post, that was reaffirmed. 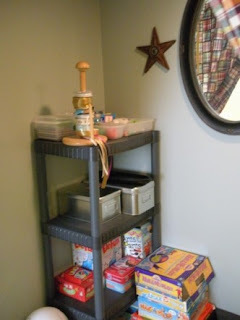 As a woman with slight OCD tendencies your organizational, grocery, and budgeting tips have all made me very excited and somewhat giddy. But today's post really closed the deal for me. I bruised my jaw. you know when it hit the desk after taking note of your exceptional organizational skills. I'm scratching my head trying to determine how in the world you do all this with 8 little hands ready to tear it all apart. You are so cool, Megan, so cool! YOWza! Love it! It's just perfection in a sweet color of green. LOL the before pic is great. You did awesome! 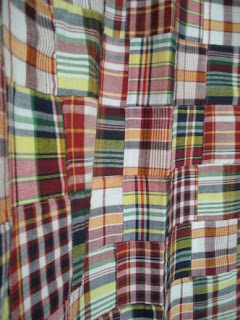 I also like the fabric...I love quilts and that's what it reminds me of. 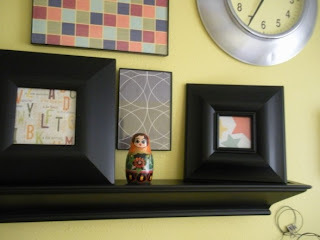 I always love your decor posts! 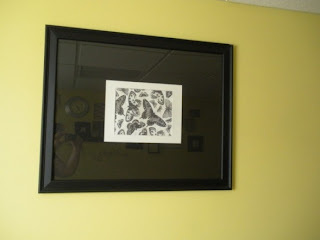 So glad you introduced me to framing paper! 2 for a dollar, baby! :-) hobby lobby rocks. I bet u feel great having it organized! Cute comment about the couch too. :-) youngins!